Verma, who had stepped down as the social welfare minister in August last year, following allegations of close links between her husband and Brajesh Thakur in Muzaffarpur shelter home scandal. PATNA: Bihar Chief Minister Nitish Kumar Saturday drew flak from the opposition RJD-Congress combine over the visit to his official residence by former state minister Manju Verma, who is out on bail in an Arms Act case. Verma, who had stepped down as the social welfare minister in August last year, following allegations of close links between her husband and Brajesh Thakur, the prime accused in the Muzaffarpur shelter home scandal, was granted bail in the case lodged at the Cheria Bariyarpur police station of Begusarai district by the Patna High Court earlier this week. The case was lodged upon recovery of a huge cache of ammunition from her residence by a CBI team, which was conducting a raid in connection with the shelter home scandal. 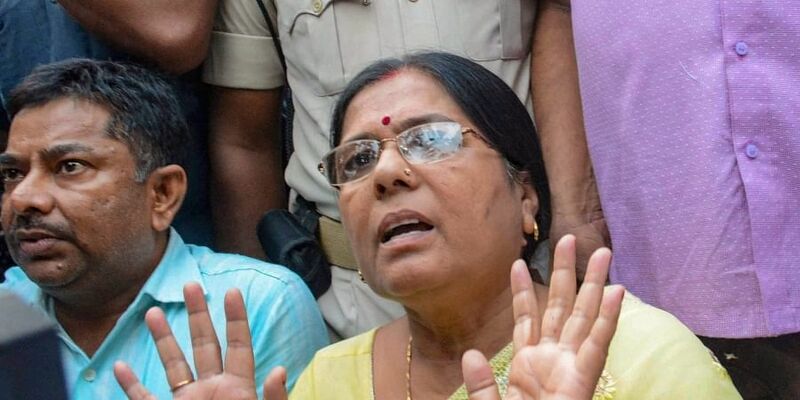 Verma, a sitting MLA from Cheria Bariyarpur, was suspended from the JD(U), headed by the chief minister in November last year after the Supreme Court took exception to her evading arrest. "The chief minister has always adopted a holier than thou attitude with regard to corruption cases against leaders of our party. Now he should explain his respect for a person undergoing trial in a serious case," RJD national vice president Raghuvansh Prasad Singh told reporters here. His comment was in reference to Kumar breaking his alliance with the RJD in 2017, following allegations of corruption against his then deputy Tejashwi Yadav whose father and party supremo Lalu Prasad is serving sentences in a number of fodder scam cases. "The JD(U) chief is jittery over losing his grip over the Lav-Kush combine he had cultivated, comprising his own caste group Kurmi and the numerically superior Koeris. But his efforts would be of no avail as Koeris have come with the mahagathbandhan en bloc since RLSP chief Upendra Kushwaha is by our side," the RJD veteran said. Verma belongs to the Koeri caste and she has been alleging that she was "framed in the case" since she was a "woman belonging to a backward class". Congress leader Prem Chandra Mishra also criticised the chief minister over the development and asked: "what message is Nitish Kumar trying to send across by meeting a leader suspended from his party on account of involvement in a serious criminal case at the time of elections".